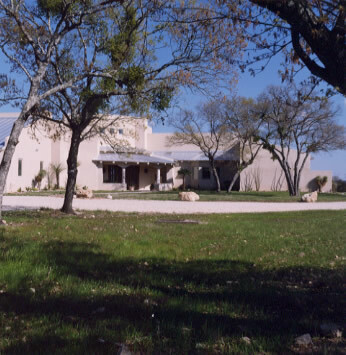 This Hill Country home was designed by Kenneth Graves, Architects of San Antonio. Red Suspenders Timber Frames designer Tim Chauvin worked closely with the architects to blend the log and heavy timber elements with the high tech aerated concrete block used for all the walls of the home. 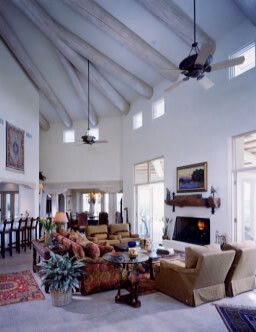 This southwest inspired design blends in well with the arid and hot Hill Country environment. 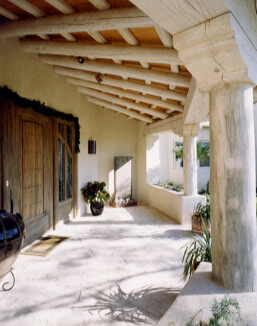 The entry porch is curved in plan. The roof is a conic section that required some intricate math and joinery. The heavy timbers are supported by log columns topped with substantial corbels. The log rafters support smaller log purlins that tract the curve of the roof. All logs in this home are Southern Yellow Pine and were peeled by hand. The logs were kiln dried slowly in our kilns to limit shrinkage and checking. The finish is hand applied white wash. 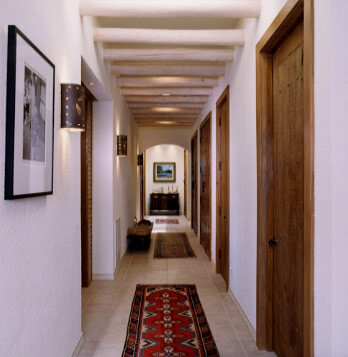 The grand entry doors complement the stone floor, heavy timbers and log rafters. The foyer features several peeled log ceiling joists. Timber headers top each doorway and the entry portal in the left of this photograph has two massive log columns, graceful corbels and a massive header beam. Passing through the entry portal and turning right you enter this beautiful hall that has numerous log ceiling joists. 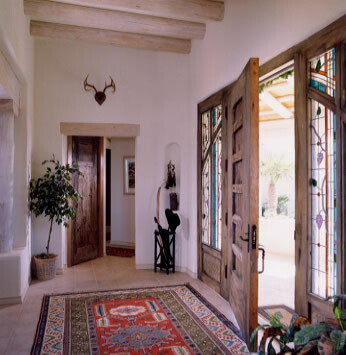 The handmade wooden doors stand out beautifully from the stucco walls. The living room ceiling features some massive log rafters. The hipped roof meant that several logs had to join at compound angles. The scribed intersections were crafted in such a manner that the smaller jack rafter looks as though it is a branch of the larger hip rafter. 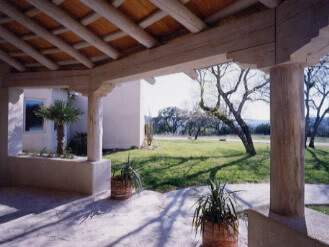 The timber portal to the dining room is visible in the center of the photograph. The dining room portal has two massive log columns supporting corbels and the timber header which in turn supports the log ceiling joists. 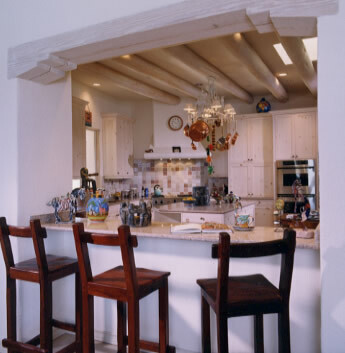 A timber header above the breakfast counter leads the eye into the kitchen which sports peeled log ceiling joists like many other rooms in the home. 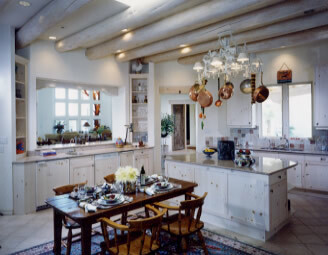 The white washed pine cabinets match the logs. Another view of the kitchen shows that each log was carefully selected for its location in the home. We hand selected logs that were much the same diameter and showed similar knot patterns for each room. The natural log bed, rustic armoire, stucco kiva and log ceiling joists give the Master Bedroom a distinct southwestern feel. The great room French doors lead onto a back porch that features a grand log roof system supported by log columns and corbels. The hip sections once again feature great log rafters joined at compound angles. As the front porch does, the back porch has peeled log purlins that support a pine board ceiling. 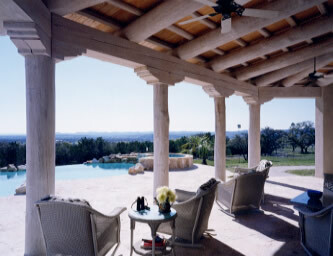 The back porch overlooks a pool surrounded by natural Texas limestone. A small waterfall flows out of the main pool to a smaller one and provides nice background music for a day in the sun.